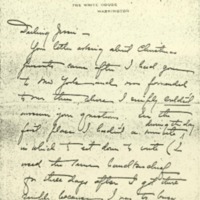 Helen suggests Christmas presents for herself and other members of the household, as well as wedding gifts for Woodrow Wilson and Edith Bolling. Your letter asking about Christmas presents came after I had gone to New York and was forwarded to me there, where I simply couldn't answer your questions. In the first place I hadn't a minute during the day in which to sit down to write (I used the same handkerchief for three days after I got there simply because I was too busy to open the hat-box in which the clean ones were! ), and by the time bedtime came I was too utterly weary to think of anything, least of all anything to suggest your giving for Christmas. But that doesn't excuse my not writing since I got back. Somehow I just haven't known the days were passing, things have been so whirly. Last Friday crept up on me a whole day early ahead of time and I found myself Friday morning with two engagements for ten oclock, one for half-past ten and two for eleven, one of the last-named in Baltimore and one here! Doesn't that sound crazy even for me? And I can't think of my words at all—not even the simplest every-day ones! To get down to Christmas presents, I'll tell you exactly what I want—a pair of silk stockings, price one dollar (because it doesn't pay to get more expensive ones) or a pair of street gloves. For Margaret I'd suggest the same, or a buttonhook (which she always needs because she loses them as fast as she get them) or a scarf to put over her head when she goes out at night. Your father is quite too much for me, but for the doctor I'd suggest a book. Edith says she'll be unhappy if you children give her h wedding-presents. I asked her if she would feel so if you gave her (you and Frank and Mac and Nell, that is) something given to you which you didn't want and she said no, that would be all right. So why don't you do that sweetie? There must be things among your presents that you'll never have any use for; and may be, indeed very likely, your father and Edith will always have more or less need of things like extra candlesticks or vases or things like that. I don't think they'll ever be able to lead a really simple life again, and I don't believe either she or your father has much silver, do you? Nell says she may give them her dining-room table, now stored in Princeton, as she'll never use it. Speaking of wedding-presents, Can can you think now of anything you are likely to need from any of the your boxes (six or seven of them) that are in the vault here? As the vault is full your father says we'd better give you warning that they are about to be put in a less accessible place. It seems Major Brookscant get things out for entertainments without moving them out of the way and as Edith may have some things that will have to be there locked up and yet accessible it seems better to put the boxes somewhere else. Have you time to look over your lists and let us know what you want to be kept get-at-able? This makes my mind jump back to the question of a present for our bride and groom. Didn't you get several sewing-tables? Why not give one of them? I certainly don't think you ought to buy anything when you have such loads of things you'll never use! How is my precious Tyrant—any more teeth? Kiss him on the top of his head for his loving slave. Bones, Helen Woodrow, “Helen Woodrow Bones to Jessie Woodrow Wilson Sayre,” 1915 November 14, WWP17525, Jessie Wilson Sayre Correspondence, Woodrow Wilson Presidential Library & Museum, Staunton, Virginia.